Bruce Schreiber's college career at the University of Wisconsin-Oshkosh wound down in 1989 and his coach couldn't speak higher of him, according to The Appleton Post-Crescent. Schreiber hit .349 by mid-May. He also led the team as one of four captains, The Post-Crescent wrote. "I can't think of a finer representative of our baseball program and university than Bruce," coach Tom Lechnir told The Post-Crescent. "The characteristics he possesses serve as the finest role model a coach could ever hope for." Schreiber went on from Wisconsin-Oshkosh to represent the school in the pros. His pro career lasted six seasons. He made AAA, but not the bigs. 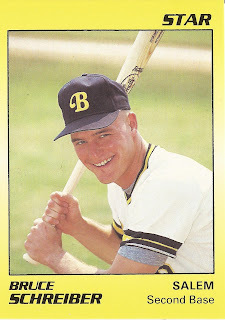 Schreiber's career began that year in 1989, signed by the Pirates as an undrafted free agent out of Wisconsin-Oshkosh. Schreiber started with the Pirates at rookie Princeton. He hit .348 in 64 games. He also hit two home runs and eight triples. His eight triples continue to be tied for fourth all-time in Princeton history. He moved to high-A Salem for 1990, then to AA Carolina in 1991. He hit .243 in 108 games there. 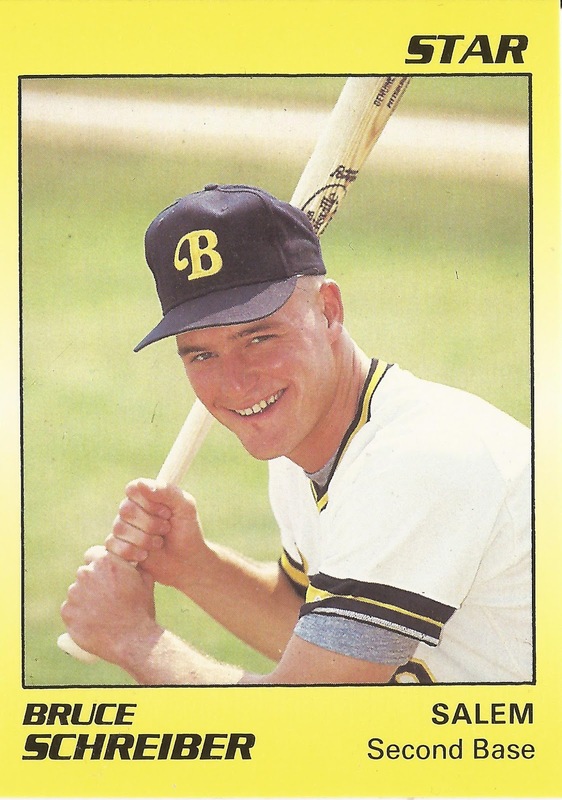 Schreiber then got his first brief look at AAA in 1992, nine games at Buffalo. He picked up two hits in 18 at bats there. The Buffalo News noted Schreiber earned a nickname "Little Rock" for his hard-nosed style of play that reminded people of Pirates infielder John Wehner, nicknamed Rock. Schreiber returned to Buffalo for 15 more games in 1993. He played the rest of the year at Carolina. He saw his final pro time, 14 games, at Carolina in 1994. Called to play the next spring during the strike, Schreiber declined. The five years he spent playing was enough, he told The Green Bay Press-Gazette. "There's a part of me that wants to go back," Schreiber told The Press-Gazette. "But I've got a decent job, and my wife was great to me during those 5 years. I gave it my best shot. When I was released, I walked away and put it behind me."